From the patchbox, the area that it originated is not a question, but the maker is unknown to me and several collectors that I have shown it to; one suggested possibly A. Pratt. No one that I have shown it to has seen such a double rifle configured like this one. It came from a old South Texas family who stated that their ancestors came to Texas in the 1830's to fight for Texas and brought this with them from Pennsylvania but they are not absolutely certain of that. It oozes charisma as a very business like rifle created as a formidable protection weapon. Very interesting double in, what appears to be, unrestored condition. I would enjoy studying this one (like to see how the locks were made), not what you normally come across. Can't say I ever saw one quite like this. Based on its uniqueness alone, I'd include it. The patchbox certainly looks New England. The locks are quite unique. I seem to remember seeing a similar lock by a New York State maker. This gun has "the look" that sure makes you wish it could talk! It definitely belongs in the Library. -----------------------------------------------------------------------------------------------At 14 lbs that's one interesting big old ka-banger! I've never seen locks like those before, and there's an interesting molding around them. I don't have a clue as to where it could have been made, but agree with XXXX on the New England looking patchbox. With those short barrels, maybe it was used to hunt bears. High probability it's a New England gun, based on the shape and engraving on patchbox, the "square-ish" tear drops at rear of side facings, and perhaps not yet noted, the wrist or thumb inlay that is humped upward in the center, generally only seen on New England guns. 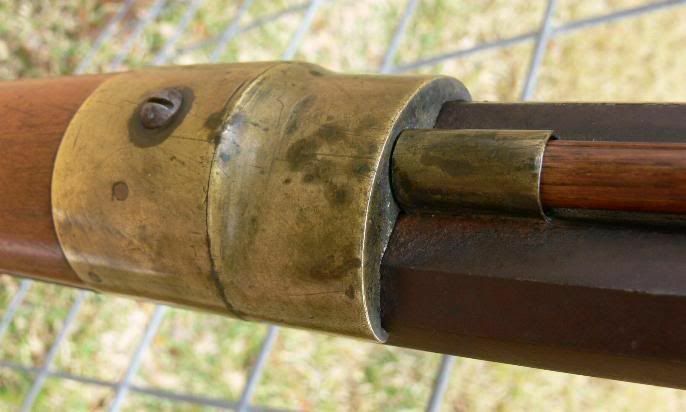 I think I've seen that star pattern around the toe plate screw heads on New England guns as well. 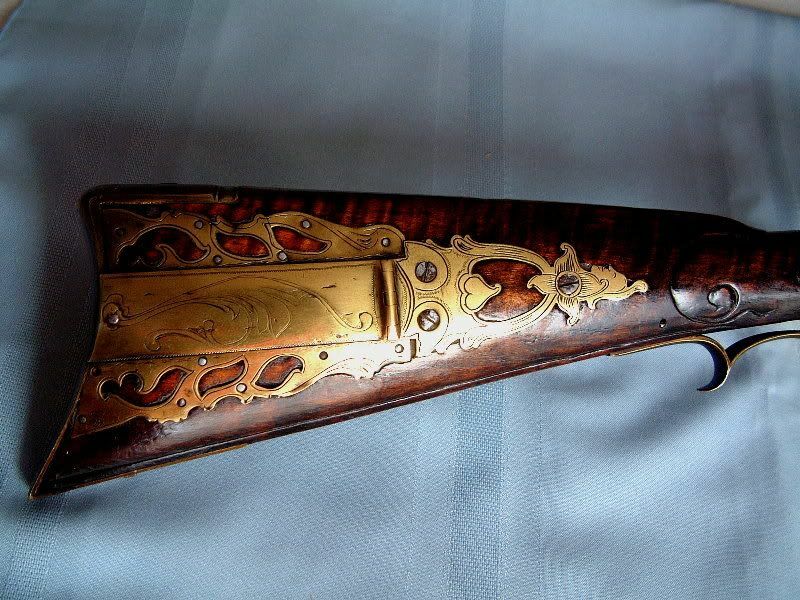 This is an interesting double rifle with a number of attractive details. 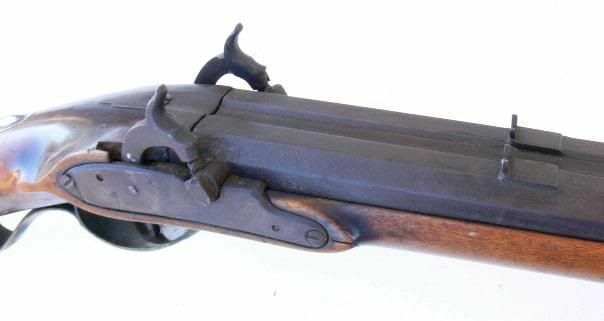 It was probably used at times for bear in yhe mountains of northern NY, and lower VT and NH.... a precursor of later New York double rifles for big "stuff" that might need a second shot to stop. I sure vote to put it in the virtual museum.